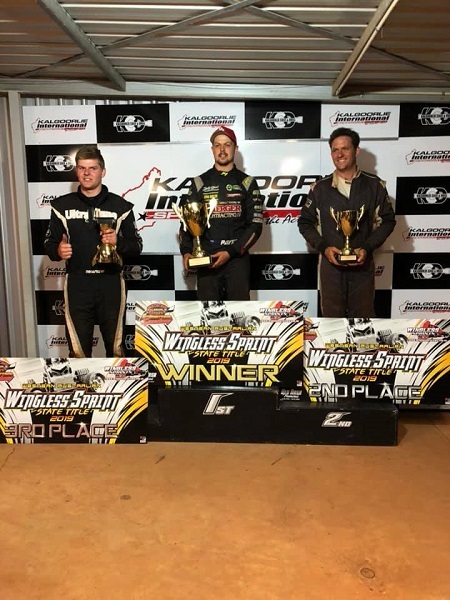 While he certainly didn’t have it all his own way, three-time Western Australian Champion Tom Payet’s experience eventually proved unbeatable during last weekend’s Western Australian Wingless Sprint Title at Kalgoorlie International Speedway, with the Perth-based racer collecting the fourth victory of his career in this event. It may have been Payet who came away with the state title crown following a late-race pass for the lead during the feature race, while making a guest appearance aboard the Trevor Jolly-owned WA # 18 Cool car, but it was Pittard Racing team driver Ash Hounsfield who looked to be the favourite, after winning Saturday night’s preliminary feature race and qualifying in pole position for Sunday night’s 30-lap WA Title-deciding feature race. After experiencing a challenging start to the weekend, blowing an engine during practice, history repeated itself for Hounsfield on lap 11 of the feature race when he once again blew his engine while leading, ultimately putting him out of contention and opening the field up to two other potential winners. Sitting in second place at the time of Hounsfield’s misfortune, Brendon Wedge immediately took control of the lead and then quickly received mounting pressure from Payet, he did very well to hold strong in his position out in front for 16 laps, before a slight miss on an ensuing restart opened the door for Payet to steal the lead. From there, nothing could be done to stop Payet as he raced to the WA Title victory for the fourth time in his career, with Wedge coming home in the runner-up spot, ahead of defending WA Champion Matthew Iwanow, who was unable to retain his mantle. Tyson Bryden was the next to cross the finish line just off the podium in fourth place, the top-10 finishers were rounded out by Nathan Walton, Tommy Britton, Bradley Taylor, Alex Robinson, Cody Dobinson and Daran Humfrey. Unfortunately unable to back up last season’s third-place finish, Matthew Fellowes had a challenging night, not quite being able to crack into the top 10, while Jake Robinson, Matthew Burston, James Bissaker and Hamish Macalpine were the last of the feature-race finishers. Joining Hounsfield on the infield were Warren Hunter and Blair Goodall, while David Worrall and Hounsfield’s teammate Chad Pittard were unable to start the feature race. It was a tough weekend overall for the Pittard Racing team, with Pittard experiencing an electrical failure during practice, before a rollover in his final heat race on Sunday night ended his campaign. In the opening night of competition, heat-race wins were awarded to Iwanow, Bryden, Payet and Hounsfield, before Hounsfield went on to win the 20-lap preliminary feature race ahead of Payet, Wedge, Pittard and Iwanow. Sunday night’s heat-race wins went the way of Humfrey, Payet, Britton and Hounsfield. The next major event for Australian Wingless Sprint drivers will be the upcoming Australian Championship at Warrnambool’s Premier Speedway. The championship, which will be held from February 21 to 23, will feature a record line-up of just under 120 cars, which will include the Pittard Racing duo of Chad Pittard and Ash Hounsfield.